Dr. J. David Tàbara is an active member of the Global Climate Forum and Associate Senior Researcher at the Institute of Environmental Science and Technology of the Autonomous University of Barcelona. He has over twenty years’ experience of EU international research on Sustainable Development and Integrated Assessment of climate strategies. He has published extensively on socio-environmental knowledge integration methods (over 100 publications), with particular attention to questions of public perception, social learning, communication and public participation for sustainability. 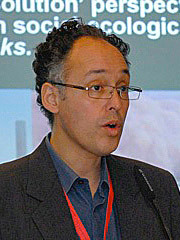 He contributed to the first book on Public Participation in Sustainability Science (Cambridge University Press 2003) and within GCF he acted as executive coordinator of the EU project Global Systems Dynamics and Policy which led to the development of the first EU Orientation Paper on Global Systems Science (www.gsdp.eu/workshops).